As promised, this review is about the new features of FamilyLink.com. Prior to uploading my GEDCOM, I emailed FamilyLink through the feedback option on the site, and have not received a response regarding the privacy of living information. I am not sure that the feedback option link is fully functional at this moment so I have inquired at WorldVitalRecords.com regarding this issue and will post a follow-up to this blog when I receive the answer. I have tried out the new feature of adding a GEDCOM which occurred seamlessly. I was able to view all of the information in the standard pedigree and family views. I removed my file without difficulty as well. FamilyLink stresses the fact that your Family Tree is YOUR data. You can remove it at any time, choose who gets to see your data, provides you with the choice of allowing other to view (user can view your tree), add (user can add information to your tree), edit (user edit your data), delete (user can delete people in your tree), download a GEDCOM (user can download your GEDCOM), living (this is one option that I am inquiring about), and view LDS data. Each of these choices can be selected or deselected individually as desired, for each person that is in your Friends/Family circle. Another nice feature of this site is that the people that are going to view your information can do so without being charged. When uploading your GEDCOM, you might want to consider privatizing your file (for the living) and to edit or note include your notes if there is sensitive information contained in them. Once your GEDCOM is imported into the Family Tree portion of FamilyLink.com, clicking on the location link will take you to a your places tab and allow you to see who is searching in the same local, see who lives close to the place your are researching and are willing to do local look-ups and it also includes a map. 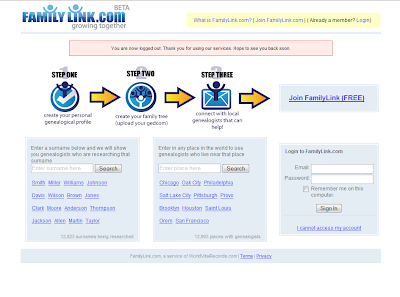 Overall, the new features added to FamilyLink.com are really nice and I have enjoyed using them. As I previously mentioned, once I get a response to my queries regarding privacy of living people, I will post their response. If you are interested in checking out this site, click Family Link to be directed to the sign up page of this site. Also from this site can search for those who might be researching the same surname or location. If you find someone that has information that you might be interested in, you can send them a message but to do so requires that you join the group. Have Fun!